The 124-unit development consisting of 36 buildings of townhouse-style units, a community center and management office sits on a 22-acre site in a quiet residential neighborhood well situated in close proximity to public parks, public transit and downtown Meriden. Chamberlain Heights is located in the City of Meriden on Chamberlain Highway, a main thoroughfare that connects Meriden with West Hartford. The development is adjacent to Route 691, which connects to several highways, Route 91 in Meriden, Route 84 in Cheshire, and Middletown to Route 15. Meriden is located in Central Connecticut, halfway between New Haven and Hartford, and approximately 100 miles from New York to the South and Boston to the North. In 2010, Meriden Housing Authority teamed up with Johnathan Rose Company and Westmount Management Group and rehabilitated this 60 plus year old once distressed public housing complex. The complete gut rehab of the buildings allowed for the inclusion of energy improvements and greater amenities within the units. The rehabilitation of Chamberlain Heights is a great improvement to the surrounding neighborhood that was negatively impacted by the once deteriorating state of the property. The reintroduction of affordable housing units on an ideally located site, adjacent to woodlands on two sides yet conveniently located within the City of Meriden is a welcome achievement. The successful execution of this development supported Meriden Housing Authority’s ongoing commitment to provide long-term affordable housing for the City’s people. The on-site community center space enables MHA and its Resident Services Department to provide Chamberlain Heights residents assistance and access to community resources to further the resident outreach, training, education and service programs. 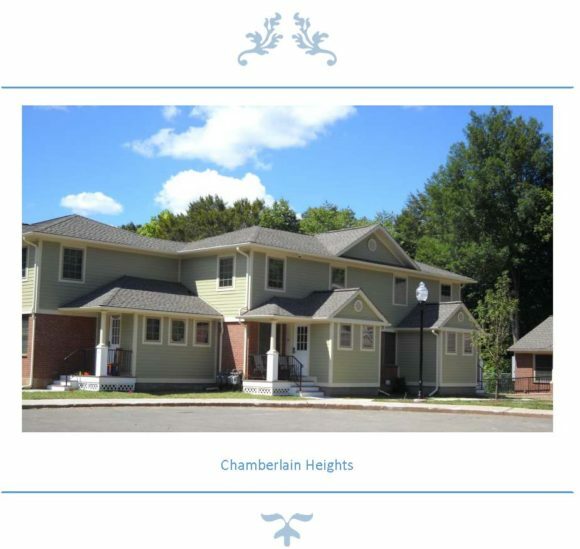 Chamberlain Heights is co-managed by Westmount Management with offices located at 141 Andrews Street, Meriden, CT. Sandra Rodriguez is the Property Manager and can be reached at (203) 235-0157 ext. 7200.